Crystal Clear Case: 360Â° Full protection, Made of high quality material, confidently protect your watch from scratches, bumps, and scuffs. Screen Protector: Ultra clear (99.9% transparency) gives you a fully optimal and natural viewing experience. Note: The screen protector ONLY covers the flat area of the watch screen, not the round edges of the watch. However, with the case included, you can provide your watch 360Â° full protection. Screen protector; Whole Transparency: The protector is 0.33mm thick and made with chemically treated, transparent tempered glass. Surface Hardness: 9H: The surface of the protector has a hardness of 9H, three times stronger than regular PET film. Even sharp objects will not scratch the protector. Case: 360Â° Full protection, Made of high quality material, confidently protect your watch from scratches, bumps, and scuffs. Ultra-Clear – Enjoy a natural comfortable fit and viewing experience with this high transparency case. 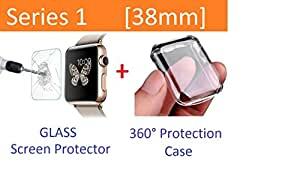 Please Note: Due to the curved-edge design of the iWatch 38mm Series1, our screen protector is made to be a little smaller than the actual screen of your device. This is to prevent the protector from overlaying these curved edges which can lead to unwanted bubbling and peeling up around the edges. We provide you with everything you need for an easy installation!